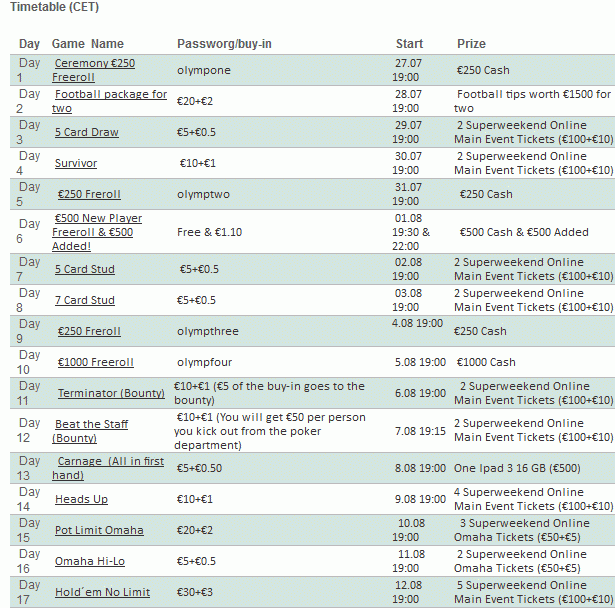 NordicBet Poker is celebrating the Onympics with the 2012 Poker Games. For 17 straight days beginning July 27th, players will compete in tournaments for some great prizes. The tournaments consist of freerolls and prize added events. Some of the prizes up for grabs include cash, tournament entries and football trips. Check out the full schedule. With little or no entry fees, these tournaments are available to all. Good luck at the tables and go for the gold courtesy of NordicBet Poker! Open a NordicBet Poker account today and receive 30% rakeback and a 100% sign-up bonus of up to €1,000 when you use the Bonus Code Poker1000.